Welcome to my ongoing Winter Hand & Skin Care Series! If you missed the first installment here (still open for entries through 10/30/11), I'll be focusing on products that can help your skin confront the colder months ahead. I have a number of products I've been sampling, and I'll share reviews with you, as well as giveaways associated with select reviews, tips & tricks for cold weather skin care, and more. Cuticle care is something that's very important to maintain, particularly during the Winter months. Our skin loses more moisture in the colder temperatures, and dry cracked cuticles are often the first thing we notice as the colder months approach. I have quite an arsenal of cuticle care products that I like to use, but none of them are designed specifically for portability. 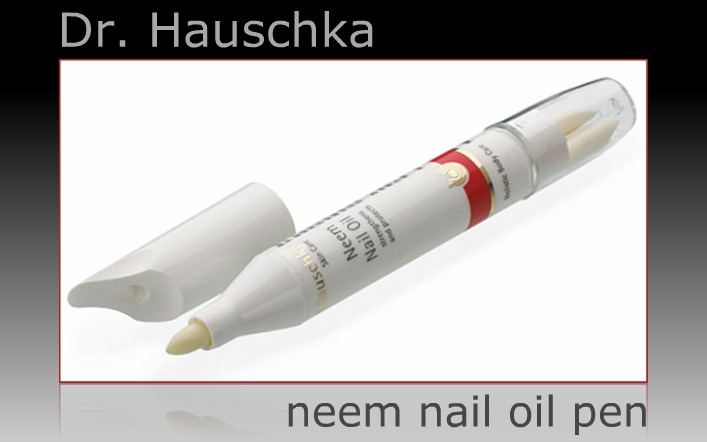 Saffron Rouge, an on line retailer specializing in organic cosmetic and beauty products, sent over Dr. Hauschka's Neem Nail Oil Pen for review, and included one for a giveaway. If you'd like to follow Saffron Rouge to stay updated on their products and specials, you can join them here on Facebook. Dr. Hauschka introduced his skin care line in 1967. "The concept was and continues to be simple: infuse nature’s healing qualities into each preparation in order to stimulate the skin's ability to find its way back to balanced health." Their product range includes items for the bath and shower, body, cosmetics, facial care, and hair care. They are a natural, sustainable, and cruelty free company. Let's take a look! The pen itself is the same length as a Sharpie marker, and a bit wider in diameter. The product size is 0.13 fl. oz. and it retails for $18.90. Both ends are capped, with an applicator at one end, and three refill tips at the other end. The applicator tip is very firm, and is much like a Sharpie marker in its composition. I'm not sure why I keep comparing it to a Sharpie, but it is a good comparison! I should have turned it a bit more in my photo, because the opposite side has a slant to it, which is designed to allow you to easily push back your cuticles when applying the oil. You can see the slant better in the photo of the refills, below. The convenience and portability of this product makes it perfect for carrying in your bag, and it allows for a mess-free application. You won't have to worry about any residue on your hands and fingers, because this applies directly to the cuticle and it dispenses just a small amount. It isn't necessary to rub it in, but it seems to work better for me when I use it that way. It's not a perfect solution because I feel that it should dispense a little more product than it does, and I've been known to remove the wrong end of the cap more than once! But it is a great option for a portable cuticle treatment for those times when you're out and about and realize that your cuticles need immediate attention. Provide intensive care to cracked and brittle nails and soften dry cuticles with this nurturing oil. 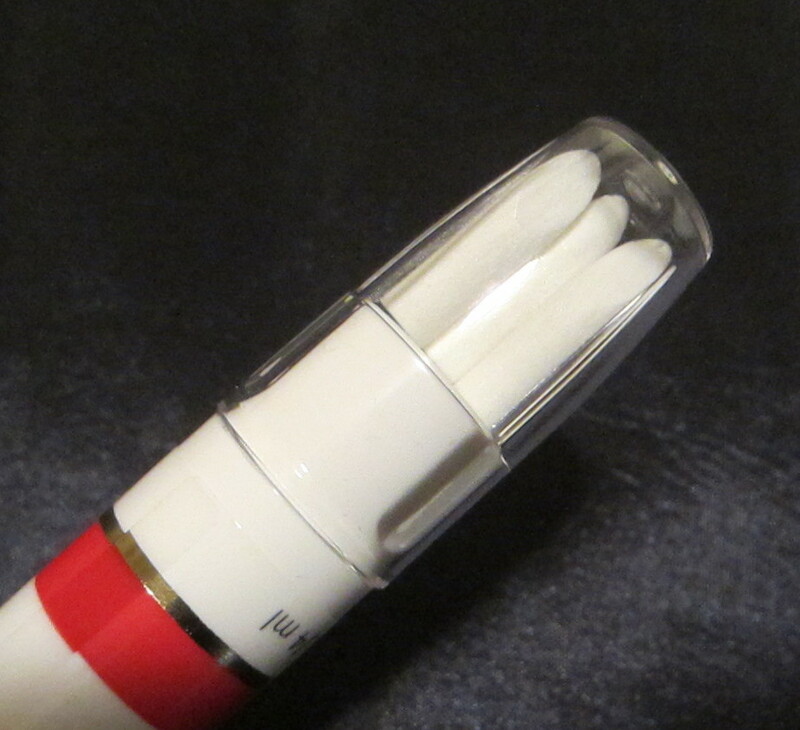 The convenient stick is perfectly portable and contains disposable tips for easy-to-use cuticle application. The fiber-like tips also help push back cuticles as you quickly dispense as much or as little oil as needed by applying pressure to the stick. Anthyllis and Indian neem strengthen keratin protein to encourage healthy nail growth and reduce breakage. Soothing chamomile calms and softens. Has a mildly medicinal neem scent. To Enter: If you'd like to enter for a chance to win Dr. Hauschka's Neem Nail Oil Pen, just leave your eMail in the comments section below. Entries will be accepted through 11/5/11, and the winner will be announced on 11/7/11. Followers only, please. *Product and prize featured were furnished by Saffron Rouge. Thank you for this review and giveaway!! I'm always on the lookout for new cuticle products! O man my cuticles definitely need that pen! Thank you! Please enter me. My cuticles could really use this, I'd love to try it! My cuticles are in terrible shape at the moment and this might be just what they need. My cuticles are always so dry and I have a terrible of picking them. I would love to try this pen. I've never seen this one. Looks great & seems it will do a good job. My cuticles are always a mess! Thanks Mary. Pena que essa marca não vende no Brasil! such an easy thing !!! I absolutely LOVe Dr Hauschka, but I have never seen this Neem Nail Oil Pen before :) but it sounds very good, and I would love to give it a try! Oh my nails and cuticles get so weak and dry during winter in Chicago! It looks like a very interesting product! count me in! Oh I need this product! Thanks for this giveaway! I've been using neem oil on my plants for years. Good to know it's been helping my hands too. Nice ingredients! I got a little scared by the fragrance/parfum, but it's natural oils so thats great. I would love to win this so much (GFC: Kvacka; email: kvacka87(AT)ymail(DOT)com)! thanks for the review and giveaway! this sounds awesome!